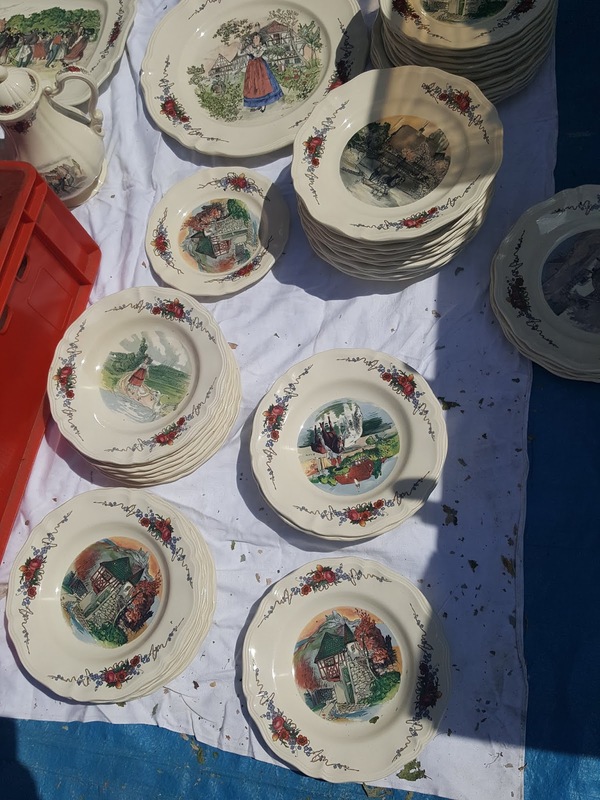 Already a month has passed since I've been to this flea market in Arlon, but the post about it waited silently its turn on my blog and I'm publishing it now since this weekend there is another flea market (Marché aux Puces) in this small Belgian town on the border with Luxembourg. 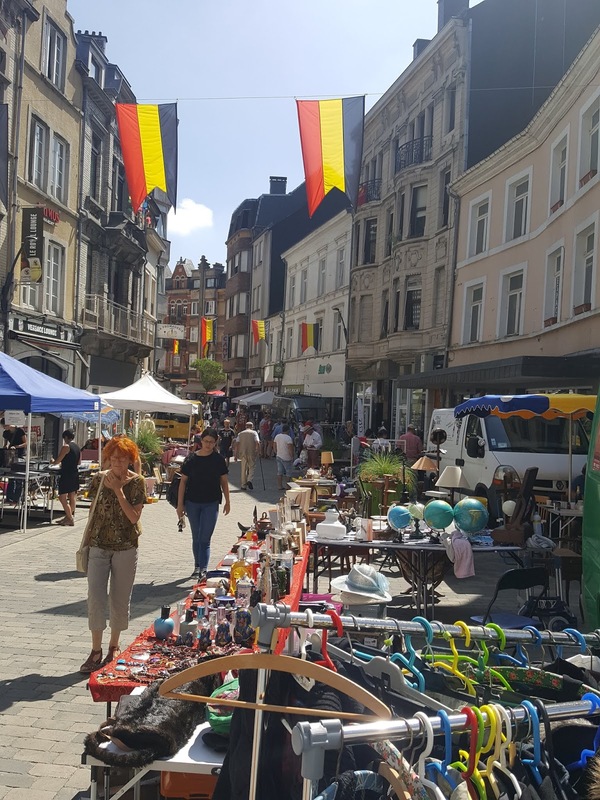 Basically, in all the first Sundays from March to November, the town centre of Arlon is closed for this market where you can find all you might think from vintage to new stuff. 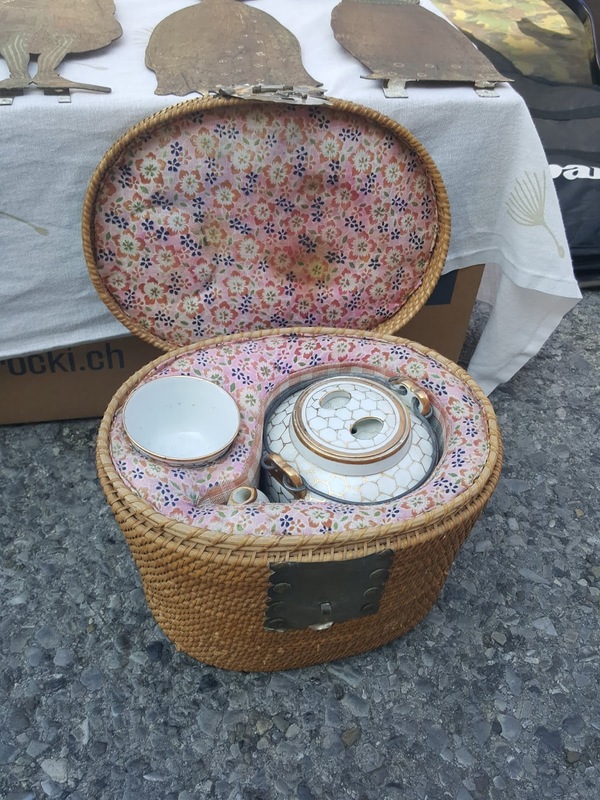 I'm usually not interested in flea markets as I rarely buy this sort of stuff, but it is interesting to browse through what they are selling as the objects are windows to past times and history and one can make a good idea about how life was in those times. 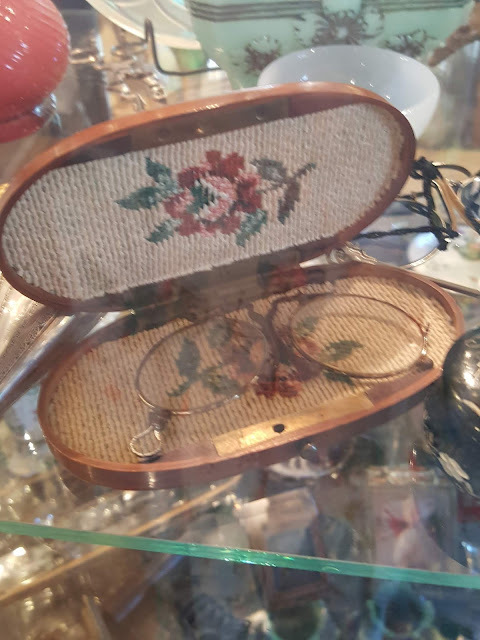 I am though on the hunt for a vintage embroidered with beads red bag, which I never found, but I do believe it is waiting for me somewhere. I hope you loved reading this post as much as I loved putting it together! Also, if you fancy keeping in contact with me, drop a line at Dichisuri.ro on Facebook. 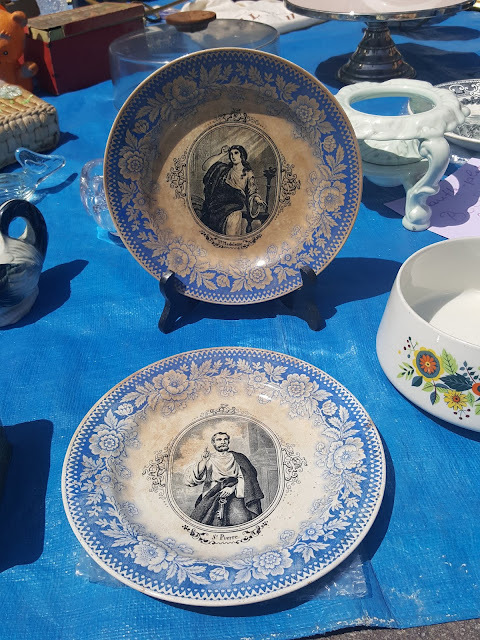 It took me so long to write about the exhibition in Sibiu which I've visited at the end of June, because I had to filter all the information and somehow enjoy it by myself before I'll start sharing it with you. I was selfish, I know, but imagine you are passionate about something and you touch the pinnacle of that field. Don't you need a couple of days to digest it all? That for me was IA Aievea exhibition in Sibiu. There were a couple of magical days in which I got to know all or most of the people I silently stock over social media, people passionate about the Romanian Blouses, people promoting Romanian arts and artisans. If you are new here, you probably have no idea what I'm talking about, so let me quickly explain. In Romania we have a traditional, old, authentic, folk, costume and part of that costume is the Romanian Blouse. A piece of clothing which is more than just a piece of clothing, it's an armour, an apotropaic shield, a language on its own, a heritage, that we recently rediscovered and which we thought it was lost. You see, Romania had to endure communism for more time than I care to count, and during that time we all had to be the same, we all had to dress the same, think the same, act in the same way and mostly do whatever we were told to do. There wasn't a time in which the uniqueness of the Romanian national costume could flourish, it had to be destroyed, our identity had to be destroyed, burned, buried, hidden. Our costume was turned into a joke, the same costume for all the regions, the same symbols for men and women, the same colours, so we all look the same. It took us more than 20 years since the communism supposedly left Romania to find what was ours all along. It was a giant effort and it's still a giant work to relearn what they wanted us to forget. One person that lead the fight was an architect from Romania and her name is Ioana Corduneanu. I remember reading her blog with a pen and paper, absorbing all she was willing to give over the Internet. She went from village to village, even to the parts of Europe which are no longer ours and rediscovered the Romanian costume, the particularities depending on the region, how it was connected to the costumes of our neighbours, the way in which it was made, reading old written books, deciphering the symbols and eventually I think it was in 2012 she gathered some like minded women and started recreating the blouses (Semne Cusute in Actiune over Facebook). The first exhibition was an amazing thing, they were relearning old techniques, people were relearning how to make their own cloth, how to naturally taint their own threads. Now looking back, the blouses were simple and somehow childish, but I have an standard from which to look back to. Then a few years later, came the second exhibition. Now the level was the superlative. The women from Ioana Corduneanu's group (Semne Cusute) recreated blouses from ethnographic museums all over the world, bringing them home. They weren't just copying the old blouses, as there was nothing to be copied, they were deciphering photos published by museums over the Internet and imagining the whole blouse. I had the honour to bring that exhibition in Luxembourg and it is called IA Aidoma. Then, came IA Aievea, when no one thought there was something more to be done. But there is always progress, they were recreating new blouses based on little pieces of cloth from old blouses. Imagine making a whole blouse from just a square centimetre of embroidered cloth. The work behind, the documentation, the years of learning, of trial and error. That's what I saw in Sibiu. Of course now you can very simply start your own blouse, because now you have the means to do it. Now you have the cloth, the threads and most importantly the knowledge. There were bumps along the way, progress was never easy, but days like the ones spent in Sibiu are worth all the struggles, all the fights, all the back stabbing, all bad mouthing as we Romanians are capable of inflicting one another. We have a saying in Romanian, "câinii latră, caravana trece" (the dogs bark, but the caravan passes) which translated means almost nothing, but for us means that when progressing towards something, there meant to be some bumps along the way, don't mind them, just keep walking. And IA Aievea is progress. I honestly don't know what the next step is going to be, but knowing the Romanian women be sure that in two years I will be mesmerised by another exhibition. So, if you happen to pass by Sibiu please do check this exhibition. It is in the Astra Museum in the Little Square, it is opened until October, but please go there with an open heart! And if you are passionate about Romanian traditions and particularly the Romanian blouse, stick around. I will write articles from time to time about it. Is graffiti a form of contemporary art? If not, it should be. If done right, it can be edgy, it can be political, it can be colourful, it can look nice and it can be thought provoking, so I do consider graffiti a form of contemporary art. On the other hand, there are murals. Although I have not researched this article, I did go on Wikipedia and found out that murals are not a form of graffiti as I previously thought, but an art on their own. The old cave paintings are murals, the painted ceilings and walls of old houses are murals, but I do think they are connected somehow. In my mind, if the graffiti is the underground of this art form, the hidden sight, the artists are mostly unknown (check out Banksy), the murals, on the other hand, are in plain sight usually commissioned by local authorities or private businesses. We live in a time when art gets out of museums and galleries, and can manifest itself in multinational companies offices, in public markets, in coffee shops, so even if you don't agree with me I will consider graffiti a form of art, rough around the edges, made in secret, form of art. 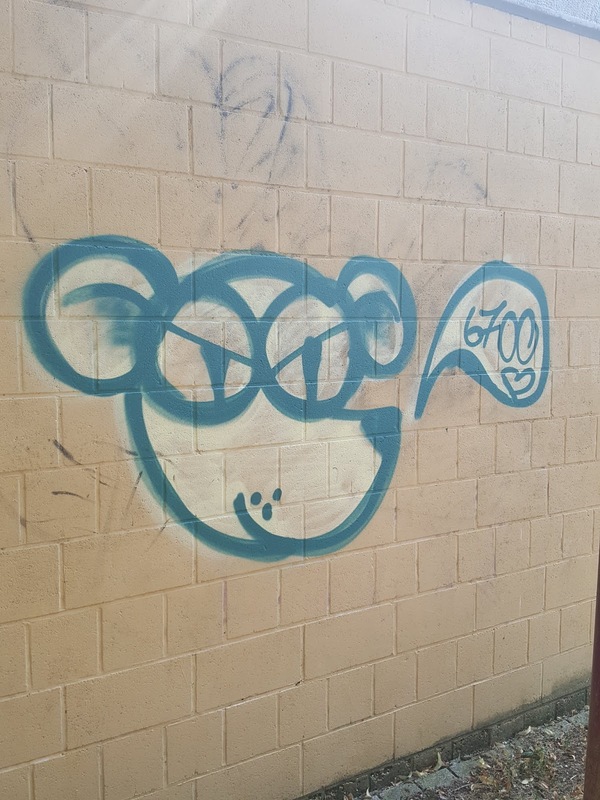 In Arlon, there is an artist, the creator of the mouse (or I'll assume it is a mouse). One of them resides on my street and the other one I've found in the city centre. One is nice, the other one is angry, but both are lovely. I've spotted the third one from my car one day, but I forgot where. 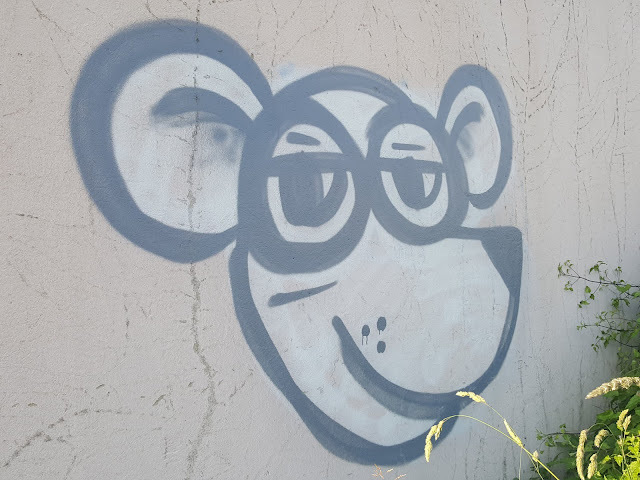 So similar to the dog-pig of Bucharest, the mouse of Arlon is part of our multicultural community and I do hope is here to stay. In any case it brings a large smile on my face every time I see it on my way to the train station. The second mouse declares that he loves Arlon (6700 is the postal code of Arlon) or this is the way I translate this graffiti. He is a little bit angry, not knowing if indeed he loves this town, but at least he says he loves it. I feel I have the same relationship with this area, everything is good, I love my garden and my house, I enjoy what I do, I've made friends, English is used more and more, but deep down if I go soul searching, I know this is not my forever home. He is ... or maybe I should not say where he is, hidden art and all. He is in plain sight, though. 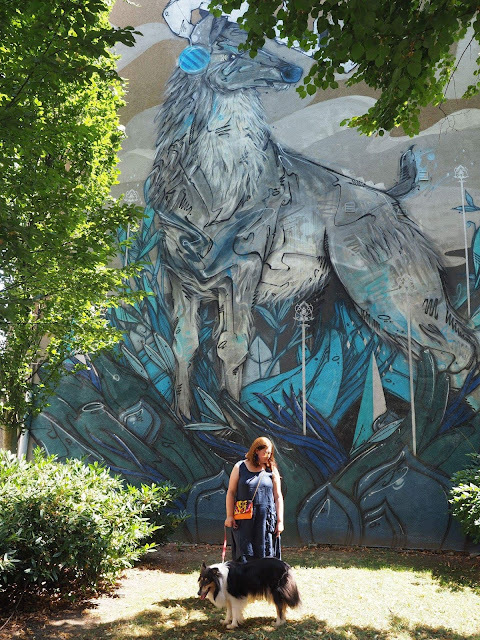 The mural, because I only know of one public mural in Arlon, is in Parc Gaspar, close to the museum with the same name and it's the one with a blue stag. The people in Arlon have something with this stag. 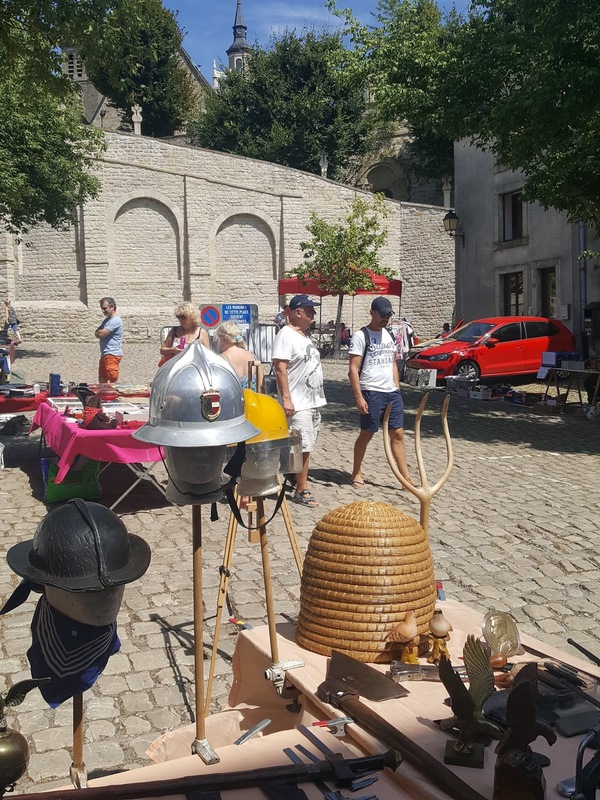 I know Gaspar sculpted it and it's displayed in a square in Arlon, they dress it and party around it in Maitrank period, but I don't know the story of Arlon's stag. Maybe is the animal symbol of this town, don't know. The mural was painted in 2017 and I imagine this is his forever home. I like to take pictures with it from time to time, I find it mysterious, hidden in the trees, and hard to photograph. Who thought that Arlon could be so artsy?